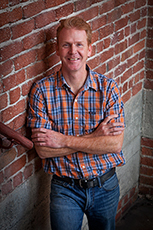 Mike Larkin attended the School of Architecture at the University of Kansas and received his BArch degree in 1987. His education included a year of study abroad in Edinburgh, Scotland and a summer study program near Sienna, Italy. Mike worked for a variety of commercial and residential architectural firms and moved to San Francisco in 1993 where he worked with Heidi Richardson Architects for three years. He has been licensed to practice architecture in California since 1995. Larkin returned to academia from 1996 to 1999 to study affordable housing and urban design at the University of California, Berkeley. He presently teaches an urban housing studio at the University of San Francisco. In 1999 Mike started his own practice which focuses on single family and multi-family residential design in Bay Area cities.